While BigCommerce is designed to allow business owners to build, manage, and run their own eCommerce stores I do find that understanding product options and option sets is confusing at first. In order to support a wide range of business types who sell a wide range of products, BigCommerce need to design the product options system to be flexible. It is this flexibility that seems to cause confusion with new store owners. I will attempt to break this down and simplify things a bit. What is a Product Option? A Product Option is designed so that you can add product variations to your product for customers to select from when ordering. Examples include colors, sizes, lengths, check boxes (yes/no, tall/short, etc), and even custom text boxes (customer can enter info like a name for engraving). Product variations (i.e. “yellow” or “white”, and “small” or “large”) are created in an option (e.g. “Color” or “Size”). These options are then added into an option set (i.e. “Pants Colors” or “Jacket Sizes”). You can combine different options into one option set as well. See the options set section below. What is a Product Option Set? An option set is a collection of one or more options. For example, you can combine the “Size” option and the “Color” option into one option set called “Jacket Option Set”. From here, you add this option set to your jacket products that offer these particular option variations. Option Sets are designed to let you reuse the same options on multiple products without having to add them manually each time. Track inventory buy assigning SKUs to your options (this is done on the product admin page, where you add the option set to the product). 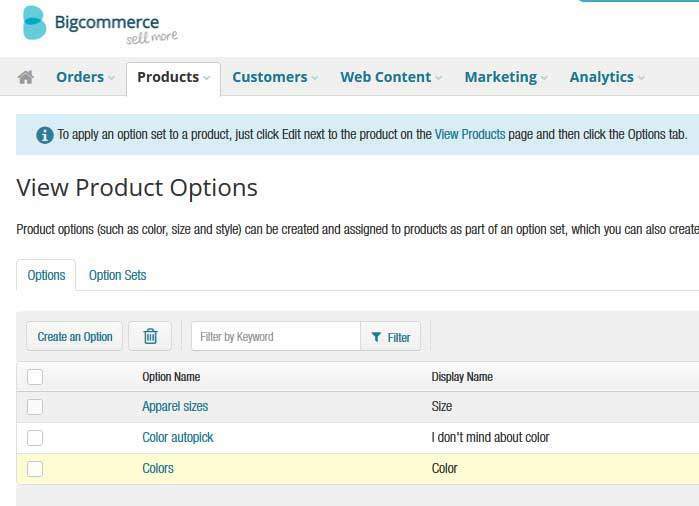 This will allow you to specifically track inventory based on size and/or color, etc. For example, if someone orders the Red Jacket in a Large Size, then your inventory for this specific product will be adjusted. Adjust product price by option. For example, you can choose to charge $2.00 more for the jacket in a size XL. When the customer chooses the XL option, the product price will adjust accordingly. Not on BigCommerce? As with all of BigCommerce’s plans, customers can test drive a BigCommerce store on a 15-day trial basis. Along with the free trial, customers can also later change or upgrade packages if desired.